51 records – page 1 of 2. Photograph of 3300 block of Clydesdale Street (old street numbering) in the Broadview District neighbourhood, looking east toward Gilmore Avenue. 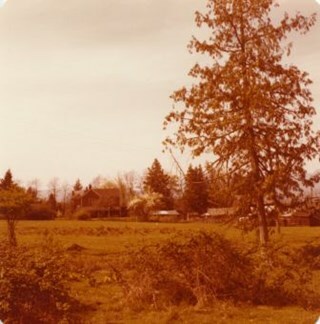 Snake Hill (Burnaby Mountain) can be seen in the background. The homes belong to the Singers, the Urquharts, the Esplins, the Strangs, and the Boggusts. The people are Ken Muir, Eva Swift and Bob Laird (married after the war), and Olivia and Olive Urquhart (daughter and mother). 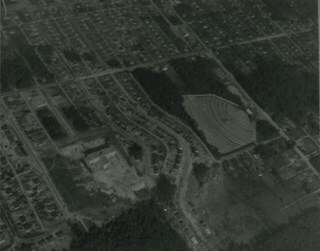 Aerial photograph of Cascade Drive-In Theatre at 4050 Grandview Highway and the surrounding area. 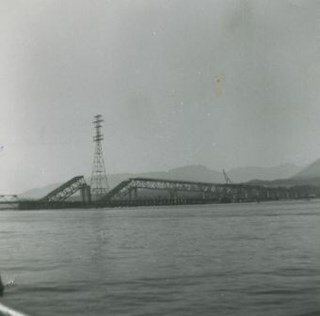 Note: Burnaby General Hospital under construction can be seen on the left. 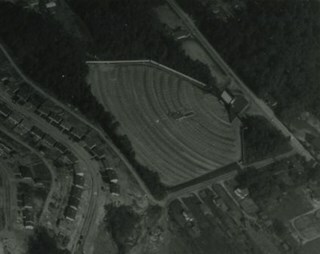 Aerial photograph of the Cascade Drive-In Theatre at 4050 Grandview Highway. 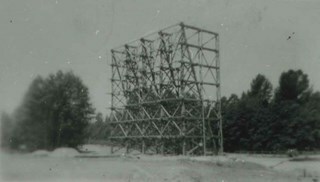 Photograph of the Cascade Drive-In Theatre screen tower at 4050 Grandview Highway. Photograph of the Cascade Drive-In Theatre, 4050 Grandview Highway, at dusk. Cars are seen parked in front of the screen and the mountains are visible in the background. 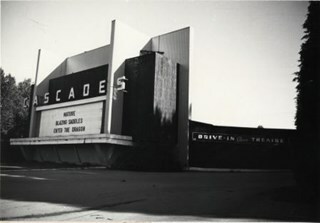 Photograph of the Cascade Drive-In Theatre at 4050 Grandview Highway. 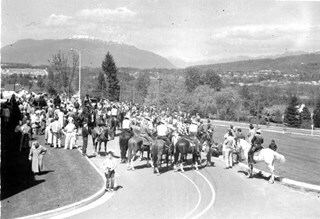 Photograph of a crowd gathering for Princess Margaret's visit to Burnaby in June of 1958. 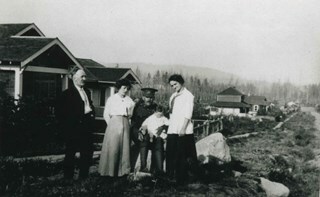 The photograph is taken outside the municipal hall located on Grandview Highway ( later, Canada Way) which can be seen on the left. There are several people gathered on the road along with people riding horses. The north shore mountains can be seen in the distance. 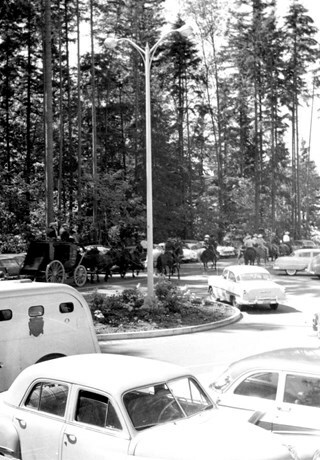 Photograph of a automobiles, horses and a horse drawn carriage gathering for Princess Margaret's visit to Burnaby in June of 1958. The photograph is taken on the roads outside the municipal hall located on Grandview Highway ( later, Canada Way). Deer Lake park can be seen in the background. 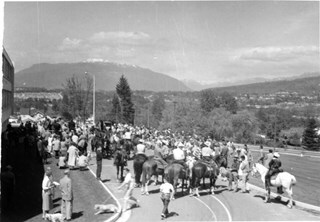 Photograph of a crowd gathering for Princess Margaret's visit to Burnaby in June of 1958. The photograph is taken outside the municipal hall located on Grandview Highway ( later, Canada Way). There are several people gathered on the road along with people riding horses. The north shore mountains can be seen in the distance. 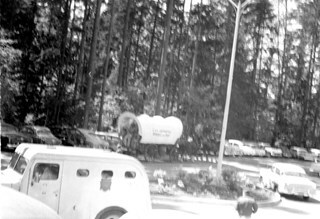 Photograph of vehicles and a horse drawn covered wagon gathering for Princess Margaret's visit to Burnaby in June of 1958. The photograph is taken outside the municipal hall located on Grandview Highway (later, Canada Way). Deer Lake Park can be seen in the background. 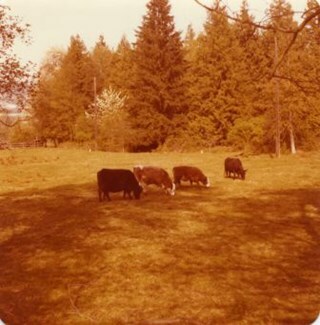 Photograph of cattle grazing on grass in a field between Canada Way and Burris Street. 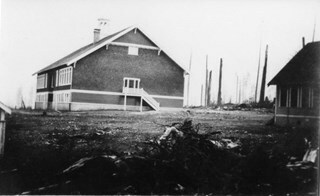 Photograph of the Schou Street School and surrounding area. Photograph of the side entrance to the Schou Street School, and its surrounding school yard. 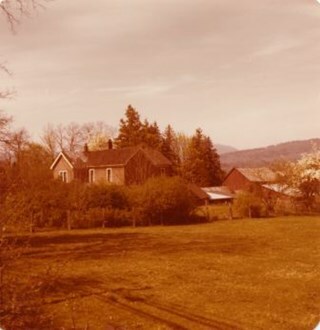 Photograph of the Lubbock family home and farm, built in 1898 by Edgar Sprott, brother of former Reeve, Charles F. Sprott. The Lubbock family moved into the house in 1915. A note with the photograph indicated that the old street address of this farm was 1 Arbor Lane. Photograph of cows grazing on the Lubbock farm with the family home seen in the background. The house was built in 1898 by Edgar Sprott, brother of former Reeve, Charles F. Sprott. The Lubbock family moved into the house in 1915. 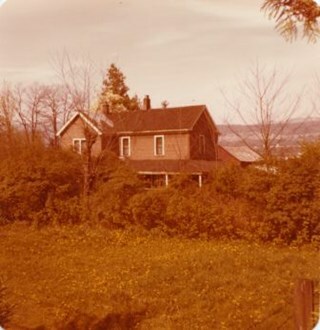 A note with this photograph indicated that the old street address of this property was 1 Arbor Lane. 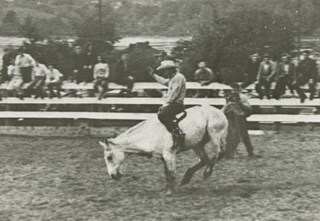 Photograph of a rodeo in a ring at the Lubbock farm. 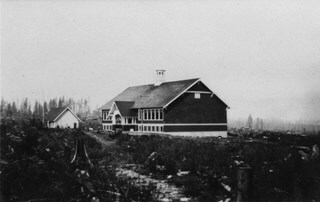 The Burnaby Lake Saddle Club was based there. 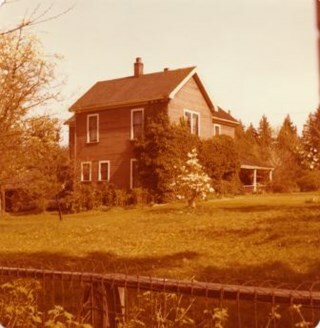 A note with this photograph indicated that the old address of the farm was 1 Arbor Lane. 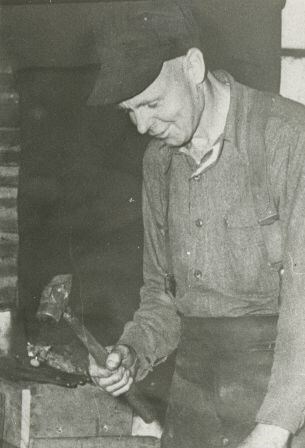 Photograph of John Lubbock working as the farm blacksmith on the Lubbock farm. 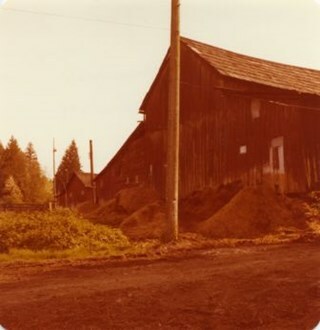 A note with this photograph indicated the old address of the farm was 1 Arbor Lane. 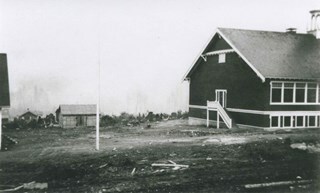 Photograph of the Burnaby Lake Saddle Club ring built in 1948 at the Lubbock farm for rodeos and other kinds of horsemanship competitions. 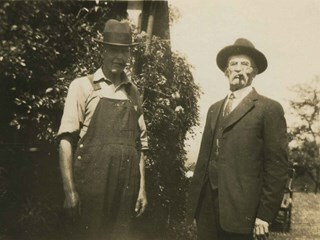 Photograph of (left, in white hat) Reeve Ran Beamish and (right) Ainsly Lubbock. 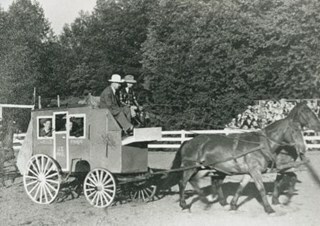 The horses, Maggie and Jiggs, are pulling a 4-X Bakery delivery wagon decorated as a U.S. Mail stagecoach. 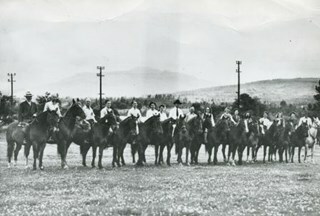 Photograph of seventeen men and women on horseback, with their horses lined up in a row at the Burnaby Lake Riding Academy at the Lubbock farm, 3455 Grandview Highway (old street numbering system). The riders are; A.H. Trunkfield, Bob Trunkfield, unidentified, two Storer boys, Vern Ferrier, Leola Legge, Dr. Coss, unidentified, unidentified, unidentified, unidentified, unidentified, Alison Sutherland, Kay Trunkfield, unidenitifed, and Gaden Legge. 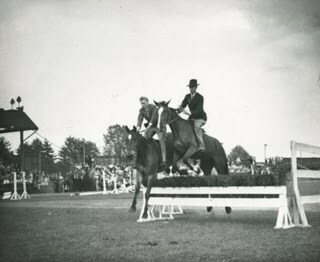 Photograph of Bud Oddy and Ainsly Lubbock jumping horses over a small fence, while a large crowd watches from the bleachers in the background. 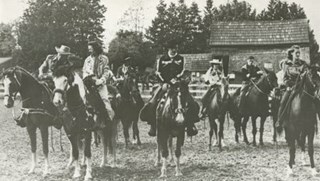 This photograph was taken at the Burnaby Lake Riding Academy at the Lubbock farm, 3455 Grandview Highway (old street numbering system). Ainsly Lubbock is the man wearing the fedora. 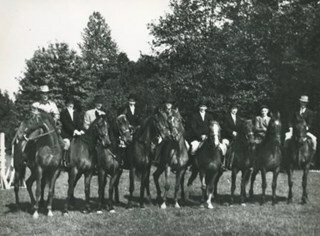 Photograph of nine men and women on horseback, with english tack and wearing english riding boots. They are outdoors at the Burnaby Lake Riding Academy at the Lubbock farm, 3455 Grandview Highway (old street numbering system). Photograph of Lubbock's farm taken from Canada Way at Haszard Street. The Lubbock stable and farm house are both visible. 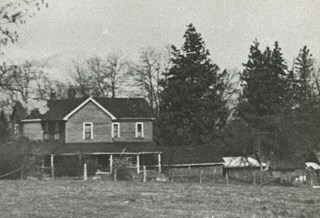 Photograph of Lubbock's farm house and surrounding trees. Photograph of Lubbock's farm house and surrounding yard. Photograph of the side of Lubbock's farm house. Horses are being lead across the parking lot, between the parked Datsun automobiles at the entrance to the farm off of Canada Way. 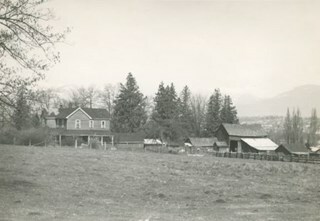 Both the Burnaby Lake Riding Academy and the Burnaby Lake Riding Club operated out of the Lubbock farm. 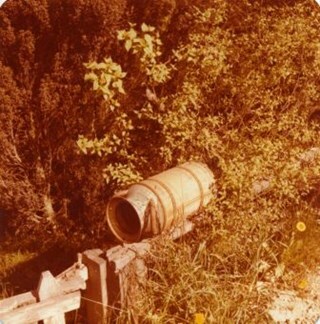 Photograph of the Lubbock mailbox, made out of a milk can, lying across the gate at Canada Way. Photograph of the Lubbock farm including surrounding fields taken from Burris Street at Canada Way. Photograph of Lubbock's farm yard and riding stable. Three horses are tied to the paddock fence, partially tacked up. 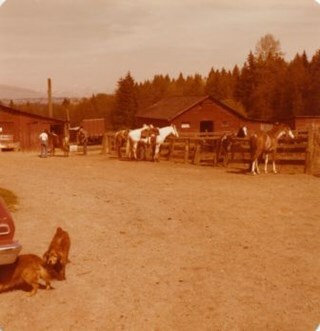 Another horse is still inside the paddock, and in the background three people are standing around a horse just outside one of the three barns visible on the property. In the foregound, one dog is following another as they crawl under a car. Both the Burnaby Lake Riding Academy and the Burnaby Lake Saddle Club operated out of the Lubbock farm. Photograph of the Lubbock riding stable. A number of horses tied on the outside of the outdoor paddock, watch as a chestnut horse gets lunged inside the paddock. 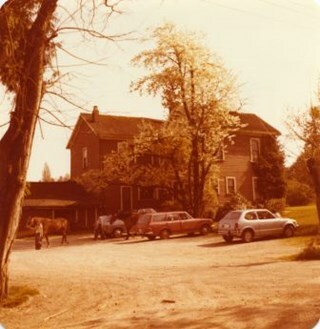 Both the Burnaby Lake Riding Academy and the Burnaby Lake Saddle Club operated out of the Lubbock farm. Photograph of the horse barn at Lubbock's farm. Both the Burnaby Lake Riding Academy and the Burnaby Lake Saddle Club operated out of the Lubbock farm. Photograph of the horse pasture at Lubbock's farm. 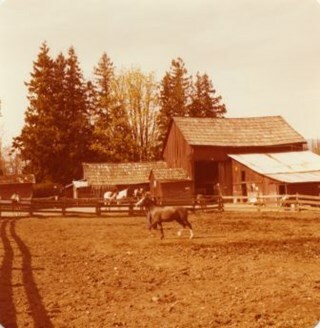 The barn and surrounding shrubbery are visible on the left, and there is a horse grazing on the grass. Both the Burnaby Lake Riding Academy and the Burnaby Lake Saddle Club operated out of the Lubbock farm. 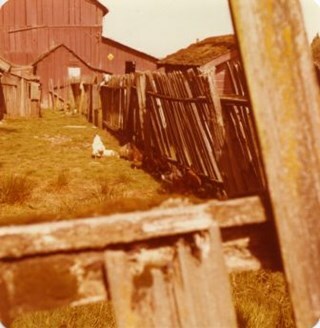 Photograph of chickens inside a tall fence at the Lubbock farm. The barn is visible in the background. 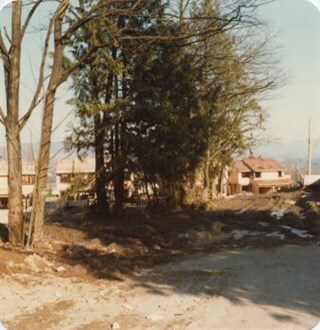 Photograph taken looking towards the "new" townhouses under construction at One Arbour Lane. This is where the Lubbock farm house and stables used to be. Photograph of a school class, probably Schou Street School. Some of the children are in costume. 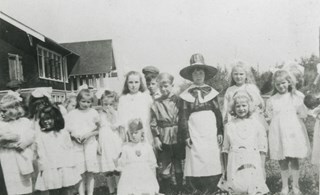 Photograph of Schou Street School students. 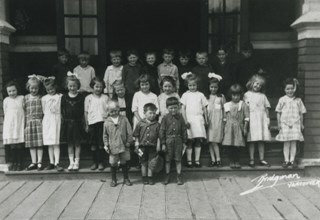 Photograph of a Schou Street School class. Identified: (behind children) Miss Chute (teacher). Photograph of the exterior of Schou Street School. 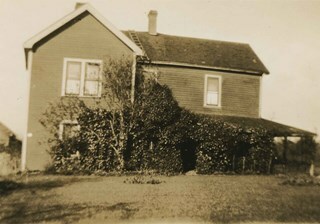 Photograph of the exterior of the Lubbock farmhouse at Canada Way and Burris. 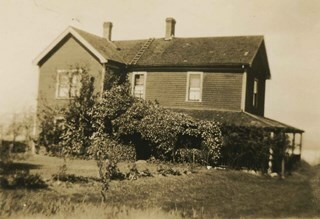 Photograph of the Lubbock family farmhouse at Burris Street and Canada Way. 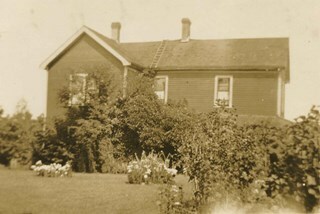 Photograph of the Lubbock family farmhouse and garden at Burris Street and Canada Way. 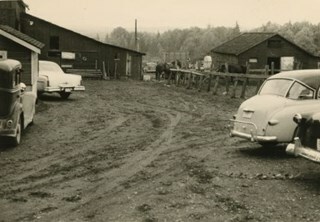 Photograph of the Lubbock barnyard, with cars from the 1930s and the 1950s parked along the side of the paddock and in front of the barn. Horses are visible in the background. Photograph of John Barker Lubbock, father of the Lubbock children, and his friend, James Henry Jones smoking cigars in the yard at the Lubbock family farm house. Photograph of the Lubbock farm and riding stable. 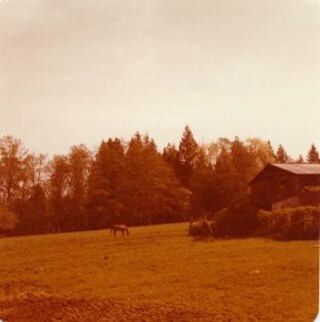 Note on verso of photograph reads: "COLUMBIAN 1976 APRIL"
Photograph of John Lubbock with a horse on either side of him, standing in front of his family's farmhouse. 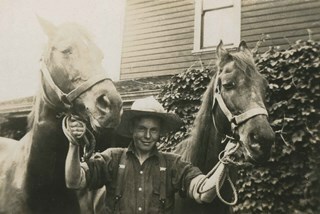 He is holding both horses by their halters. 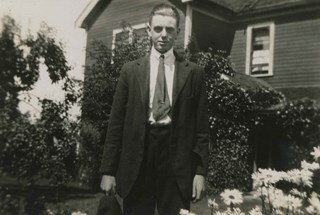 Photograph of Gordon Lubbock in a suit and tie, standing outside the Lubbock farmhouse. 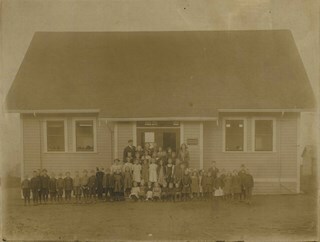 Photograph of a class of approximately fifty-three children and two teachers outside the newly built Broadview area school. This was the first class photograph at the Broadview School. 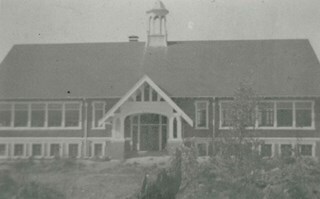 This shool was later replaced by the Schou Street School and the building was used as a community centre. 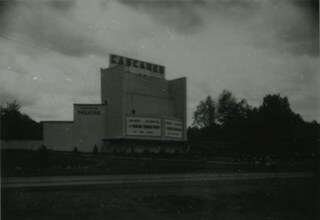 Photograph shows the Cascades Drive-in Theatre at 3960 Canada Way (previously 4050 Grandview Highway). The theatre was built in 1947.